This adorable overall outfit fits 13 inch Adora Playtime Babies, and other similar sized baby dolls. Play all day! 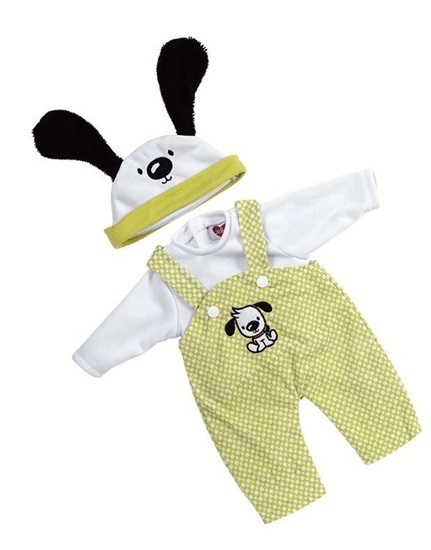 Thats what you will want to do with this adorable ensemble of lime green print overalls with two white plastic snaps on the front and an embroidered puppy! A matching hat with two puppy ears and a white jersey top completes this playful ensemble! This adorable outfit is designed to fit 13 inch Playtime baby dolls and other similiar sized baby dolls.